Hundreds of pro-Moscow separatists stormed government buildings in one of Ukraine’s provincial capitals Tuesday (29 April) and fired on police holed up in a regional headquarters, a major escalation of their revolt, auguring for an “election nightmare” on 25 May, when Ukrainians will elect a new president. Demonstrators smashed their way into the provincial government headquarters in Luhansk, Ukraine’s easternmost province, which abuts the Russian border, and raised separatist flags over the building, while police did nothing to interfere, Reuters reported. The rebels also seized the prosecutor’s office and the television centre. The separatist operation in Luhansk appears to give the pro-Moscow rebels control of a second provincial capital. They already control much of neighbouring Donetsk province, where they have proclaimed an independent “People’s Republic of Donetsk” and declared a referendum on secession for 11 May. 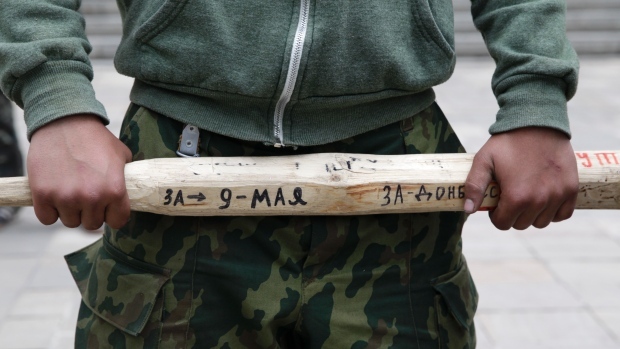 The rebels include local youths armed with clubs and chains, as well as “green men” – heavily armed masked men in military uniforms without insignia. Adding control of Luhansk would give them sway over the entire Donbass coalfield – an unbroken swathe of territory adjacent to Russia – where giant steel smelters and heavy plants account for around a third of Ukraine’s industrial output. It is the heart of a region that Putin described earlier this month as “New Russia”, reviving a term from when the tsars conquered it in the 18th and 19th centuries. Most people who live in the area now identify themselves as Ukrainians but speak Russian as their first language. Both the authorities in Kyiv, and their Western supporters would like the planned vote on 25 May to take place, not least because international assistance is contingent on a swift move back to elected rule. Regarding the areas controlled by separatists, the Commission said that conditions will be created so that Ukrainians living there could vote in other places or via Internet.